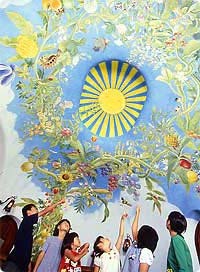 Look up at the ceiling, and you will find it covered in fresco painting. In the center of a blue sky, there is a shining, smiling sun. Trees stretching up towards the sky are filled with grapes, melons, deliciously ripe fruits, and beautiful blossoms which you may never have seen before. If you look carefully, you may see Kiki on her broom, Nausicaa on her jet glider, or other characters flying through the sky. Tickets are given over to visitors here in exchange for reservation coupons. These tickets are made of pieces of the actual 35mm film prints that were used in theaters. You can hold it up to the light and see which scene from a Ghibli film turned out to be your ticket. Since the Ghibli Museum treats every child as an independent guest, even very small children can stand on the special platform at the reception counter to be handed their own ticket.